On April 15th, 2016 while fishing the waters off Boca Grande, angler Mallory Herzog caught and tagged a Bull Shark (Carcharhinus leucas) aboard the charter boat Big Bully Outdoors with Captain Andrew Herzog. Mallory named the fish “Chopper” (GFR3579). The Bull Shark was measured at 76 inches (193.04 cm) total length and released in excellent condition. 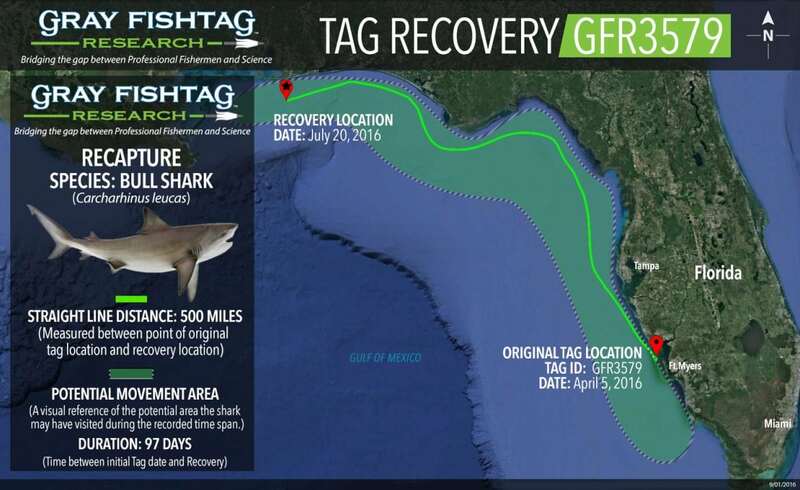 That Bull Shark was recaptured 97 days later on July 20th, 2016 by PhD student Megan McKinzie while fishing on the R/V Mary Lou out of the Dauphin Island Sea Lab (DISL) on Dauphin Island, Alabama. The recapture was approximately 500 miles (795 km) away from the original tag location. During that 97-day time period, the shark most likely stayed in the coastal waters of the Florida Gulf Coast as it made its way north. The shallow coastal waters less than 100 feet, are ideal habitat with an abundance of prey items, such as mullet, menhaden, jacks and other coastal schooling fish species. At the time of recapture, the Bull Shark had a measured total length of 79 inches (200 cm). Based on the length measurements, this shark was a right around the size when they reach maturity. After the tag information was recorded, the Bull Shark was also tagged with an acoustic tag as part of Ms. McKinzie’s ongoing research studies and then released healthy and unharmed. The Bull Shark (Carcharhinus leucas) is a large stout shark species. They have a robust body with a rounded, blunt snout. On average, they are around 200 to 290 pounds and grow to about 8 feet long. They are generally exhibit a plain gray coloration on the dorsal side, fading to white on the underside. The first dorsal fin is large and triangular with a pointed tip. The pectoral fins also have a large and angular shape. The Bull Shark eye is relatively small when compared to other sharks of the same family. They reach maturity at just over 200 cm total length. Bull sharks give birth to live, free-swimming young. At birth, they are around 29 inches in length and female Bull Sharks grow larger and have a longer lifespan compare to males. Bull Sharks inhabit tropical and subtropical coastal waters worldwide. They are most commonly found in shallow water areas from bays, estuaries, and other brackish water areas. It is the only shark species that readily occurs in freshwater, however they do not spend their entire life in freshwater. Bull Sharks are not targeted as a commercial fish species. Recreationally, they are considered a popular coastal game fish, known for their aggressive fight. Fun Fact: Bull Sharks were blamed for series of attacks in the shallow tidal waters of New Jersey in 1916. Those shark attacks were inspiration for the book Jaws by Peter Benchley, which was later turned into a blockbuster movie. The Big Bully Outdoors charter boat crew will receive Gray FishTag gear for their tagging efforts. The tag recovery angler, Megan McKinzie, will receive a pair of Costa Del Mar sunglasses, a Tag & Recovery Certificate, and Gray FishTag gear for reporting the tag recovery.